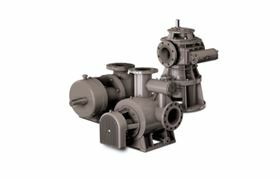 The basic design of the pump entails two screws, a drive screw and an idler screw. During pump operation, these integral shaft screws are engaged and form a sealed cavity with the surrounding pump housing. The pumped liquid is transported axially as the screw shafts turn and is conveyed in a consistent and pulseless flow to the pump discharge port. Since hydraulic forces on the two screws are balanced, there is little or no hydraulic stress on the screws, promoting maximum life of the internal pump parts. In a variant of the S Series, the twin screw pumps employ timing gears to transmit the power from the power screw shaft to the idler screw shaft to reduce the possibility of wear when pumping abrasive materials, or where special materials of construction dictate non contacting operation. The S Series Triple Screw pump is designed for handling clear, lubricating liquids without solid content. The internal structure of the Triple Screw includes a male drive spindle, two female secondary spindles and a housing containing the three screws. Within the sealed chamber, the three rotating screws move the material along in the axial direction and toward the discharge port in a linear and surge-free manner.